Nobody Is Moving Our Cheese: American Surplus Reaches Record High Americans consumed almost 37 pounds per capita in 2017, but that wasn't enough to reduce the country's 1.4 billion-pound cheese surplus. The stockpile of cheese started to build several years ago. Cheese is packaged for sale at Widmer's Cheese Cellars in 2016 in Theresa, Wis. Record dairy production in the U.S. has produced a record surplus of cheese causing prices to drop. It's a stinky time for the American cheese industry. While Americans consumed nearly 37 pounds per capita in 2017, it was not enough to reduce the country's 1.4 billion-pound cheese surplus, according to the U.S. Department of Agriculture. 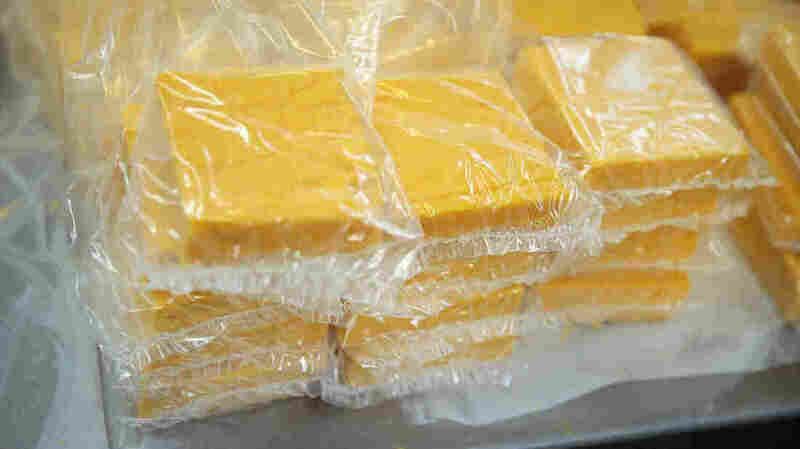 The glut, which at 900,000 cubic yards is the largest in U.S. history, means that there is enough cheese sitting in cold storage to wrap around the U.S. Capitol. The stockpile started to build several years ago, in large part because the pace of milk production began to exceed the rates of consumption, says Andrew Novakovic, professor of agricultural economics at Cornell University. Over the past 10 years, milk production has increased by 13 percent because of high prices. But what dairy farmers failed to realize was that Americans are drinking less milk. According to data from the USDA, Americans drank just 149 pounds of milk per capita in 2017, down from 247 pounds in 1975. Suppliers turn that extra milk into cheese because it is less perishable and stays fresh for longer periods. But Americans are turning their noses up at those processed cheese slices and string cheese — varieties that are a main driver of the U.S. cheese market — in favor of more refined options, Novakovic tells Here & Now's Jeremy Hobson. Despite this shift, sales of mozzarella cheese, the single largest type of cheese produced and consumed in the U.S., remain strong, he says. "What has changed — and changed fairly noticeably and fairly recently — is people are turning away from processed cheese," Novakovic says. "It's also the case that we're seeing increased sales of kind of more exotic, specialty, European-style cheeses. Some of those are made in the U.S. A lot of them aren't." Novakovic also notes that imported cheeses tend to cost more, so when people choose those, they buy less cheese overall. The growing surplus of American-made cheese and milk means that prices are declining. The current average price of whole milk is $15.12 per 100 pounds, which is much lower than the price required for dairy farmers to break even. "It's the same as it is for everything else: If you've got too much of something, the price has to go down until consumption rises," Novakovic says. Some analysts have raised fears that U.S. trade disputes with China and Mexico could also negatively impact the dairy industry. But according to the U.S. Dairy Export Council, the impact of retaliatory tariffs on American dairy products has been relatively small, not to mention that the U.S. exports only about 6 percent of its cheese. That is to say that the price of letting pounds of cheese sit idle in cold storage comes back to dairy farmers. Since the 1970s, the industry has consolidated with more cows housed on larger farms, but now even those farms can't compete. In Wisconsin alone, hundreds of farms closed in 2018, The Wall Street Journal reported. "A lot of farmers would say, 'Well, make it stop.' But the fact of the matter is we're still pushing out a little bit more milk than we know what to do with," Novakovic says. "And really, it's not a big number, but until those two numbers get reconciled, we're going to continue to see these low prices."